SD Pharmaceuticals’ RHODIOLA ROSEA 200™ delivers a scientifically-validated percentage of key actives, Rosavin (3%) and Salidroside (1%). These precise and research-validated percentages of active compounds are exactly what clinical studies have used to deliver incredible stress support and health-promoting benefits! In addition, SD Pharmaceuticals’ RHODIOLA ROSEA 200™ includes the clinically-tested absorption ingredient, AstraGin™, to support optimal absorption of Rhodiola, for maximum results! Rhodiola rosea, also known as roseroot or golden root, has a long history of use as a valuable medicinal plant. As early as the 19th century, Rhodiola was being used in France as a brain tonic. In more recent times, extensive studies of the stress-protective (or adaptogenic) properties of Rhodiola extracts, were conducted in the USSR, and preparations of the root now form part of official medicine in Russia and other countries of the former USSR. In Sweden, one of the most advanced botanical medicine countries in the world, Rhodiola has been recognized as an adaptogen and botanical medicine since 1985. In addition, it is classified in the Swedish Drug and Therapy handbook as one of the most commonly used stress-protective agents in the group of officially registered herbal medicine products. SD Pharmaceuticals RHODIOLA ROSEA 200™ Advantage! 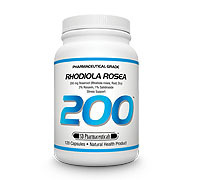 Why is SD Pharmaceuticals’ RHODIOLA ROSEA 200™ better than all other Rhodiola products? First off, to get the best results from Rhodiola, you must use an extract that is precisely standardized to the active compounds, Rosavin (3%) and Salidroside (1%). Secondly, the large majority of research proves that a 200 mg dosage of Rhodiola is optimal. Taking more than 200 mg per single dose can actually have detrimental effects on stress support in many people and that’s why most Rhodiola products currently on the market aren’t as effective as they could be because they’re under-dosed or over-dosed. Health Canada’s Natural Health Product Directorate (NHPD) newly published Rhodiola Monograph states “not to exceed 200 mg per single dose,” because taking too much Rhodiola at one time can actually induce stress and anxiety in some people. SD Pharmaceuticals’ RHODIOLA ROSEA 200™ delivers precisely 200 mg of Rhodiola per capsule and it’s standardized to exactly 3% Rosavin and 1% Salidroside. These clinically-validated specifications make SD’s RHODIOLA ROSEA 200™ product the most effective Rhodiola product for fighting stress, relieving depression and fatigue and improving cognitive function and performance! In addition, RHODIOLA ROSEA 200™ uses the clinically-proven and patented absorption enhancer, AstraGin™, to further improve its absorption and effects! 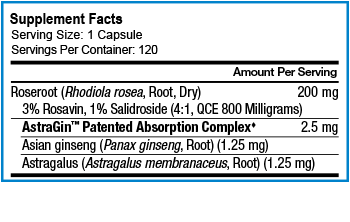 SD Pharmaceuticals’ RHODIOLA ROSEA 200™ is standardized to precisely 3% Rosavin and 1% Salidroside!